Philip's previous attempt in 1937 at a projection set had been somewhat disasterous, with the extrodinarily short life of the C.R.T. 's (in terms of weeks!) resulting in Philips offering to buy back the sets by November of that year. With the launch of the Tel61 Philips claimed the C.R.T. had been much developed and improved. The television image was produced on the end of a small 4-inch diameter cathode-ray tube which was then enlarged by means of an f1.9 anastigmatic lense. The enlarged image was reflected via an angled mirror mounted in the lid and onto an 18-inch wide screen. The screen consisted of a flat etched glass section which was protected for dust and dirt by having it enclosed between two sheets of glass. The screen automatically slid into position as the lid was raised, with a slow motion device preventing damage by stopping the mirror and screen rising or falling too quickly. The Mullard 4 in. diameter projection C.R.T. was operated from a 25,000-volt supply and ustilised magnetic focusing and line/frame deflection. The C.R.T. was completely screened magnetically and mounted with the projection lens in gimbals to facilitate optical centring of the picture on the projection screen. The 25kV E.H.T. supply was obtained from a voltage doubling rectifer unit using two Mullard 1878 H.T, rectifiers. A rare gas discharge tube connected across the supply to the first anode of the C.R.T. prevented excessive voltage developing and damaging the C.R.T. As a safety precaution (a rare event for the period!) the whole E.H.T. supply was contained in an earthed steel case with interlocked switches and an earthing device on the door. Opening the door broke the supply to the rectifier and automatically earthed the E.H.T. terminals. Vision and sound receiver with synchronising separator. Frame and line time bases and H.T. supply. Projection assembly containing the cathode-ray tube. The first four chassis units were bolted to a steel framework which could be completely removed from the cabinet for servicing work, with the front controls being extended via Bowden cables. The aerial fed into a tuned aerial transformer connected to the grid of a radio frequency amplifier using a TSP4 valve. Separate frequency changers for sound and vision were employed, with a push-pull oscillator section using an oscillator frequency of 31.8 mc/s. The 13.2 mc/s vision I.F. was amplified by four TSP4 stages aligned for single side band (a practice that improved the signal-to-noise ratio). This in turn was demodulated by a small television diode type T4D and R.C. coupled video frequency output stage using a Pen A4 valve. A further T4D was used to D.C.-restore the signal before passing on to the C.R.T. Meantime, the 9.7 mc/s sound I.F. was amplified by a TSP4 stage and demodulated by yet another T4D diode, which also applied A.V.C. to the I.F. stage. The demodulated audio signal was then connected to the pick-up sockets of the broadcast receiver chassis that was based on the Philips 753A radio. 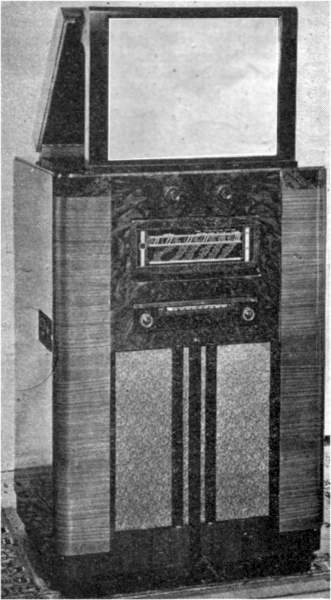 The radio chassis in turn drove two seperate speakers mounted in the cabinet. The frame scan was obtained from a 2-valve circuit using a gas triode and pentode output. The line scan used a 3-valve circuit with a gas triode driving two parallel-connected power pentodes in the output stage. If either timebase were to failed, the beam would scan in a single or horizontal line, so given the extreme brightness at which the tube was needed to operate this would cause either a horizontal or vertical straight line to be burnt into the screen's phosphor, effectively destroying the C.R.T. Therefor Philips included safety relay circuits, each driven from a gas-filled triode connected connected across the line and frame deflection coils ; should either of the scans fail from any cause, the voltage on the grid of the appropriate gas triode wwould fall and the relay in its anode circuit opened the supply to the E.H.T. transformer, thus cutting off the E.H.T. to the C.R.T. tube and preventing damage to the fluorescent screen. References:- 1/ Television and Shortwave World, September 1938. 2/ 1938 Philips advertising brochure.